This is another in my series of bronze bricks from Winthrop Lane, which I previously posted about here and here. 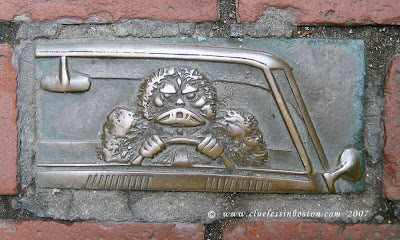 This one is probably my favorite as it clearly depicts the average Boston driver's mentality once he or she gets behind the wheel of a car. Why anyone would want to drive downtown is a mystery to me. I think I would rather visit the dentist than drive in Boston. Wha??? You have two daily blogs? How do you do it? Great one too! I've enjoyed my Boston promenade. Oooooh - I hate city driving... I am definitely a country girl! Visiting your blog... I'll take a look 'round. My brother joined his wife in Boston recently when she went to a convention. He said if they had not had a GPS on the car they rented to go see fall leaves with in Coonecticut, they'd probably still be in Boston, weeks later. I've enjoyed browsing through your most recent posts.